Over here, shower curtains don't really exist. 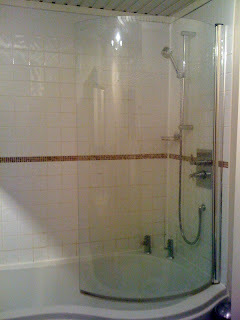 They put up these three foot pieces of glass in the shower and expect you to not destroy the bathroom while showering. I really don't get it. At our old place in Edinburgh, we just put up a shower curtain and rod brought with us from the states...I was smart enough to pack one in my things! (no joke) Now that we have moved, our bath/shower is much longer and the shower curtain rod doesn't work. This leaves us trying to figure out how to shower without destroying our bathroom. Ian is a little better at it than me. If I am not paying attention, I end up spraying water all over the bathroom. It can be quite the mess! But, both of us seem to get the ledge of the bath totally wet, which in turn drains all over the floor and the rug we have right there, creating quite the mess. If we put the rug on the radiator, it dries, but who really wants to do that every single stinking day?!? I think I need to be trained to take more mellow showers! On a good note, the bathroom of our new place is about three times the size of our old bathroom! And, it has a heated towel rack attached to the wall! Though I never seem to take showers at the right time to use a heated towel, it does mean I get to use a dry towel and that is something I can get on board with! I love heats towel racks!!!! I wish I had one in SLO because my towels don't dry. 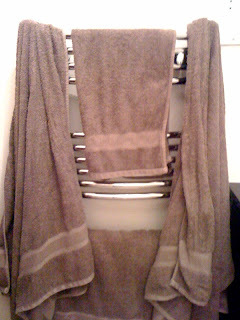 I like the towel rack too! Way sweet! How about hanging the curtain rod by wire from the ceiling?? ?